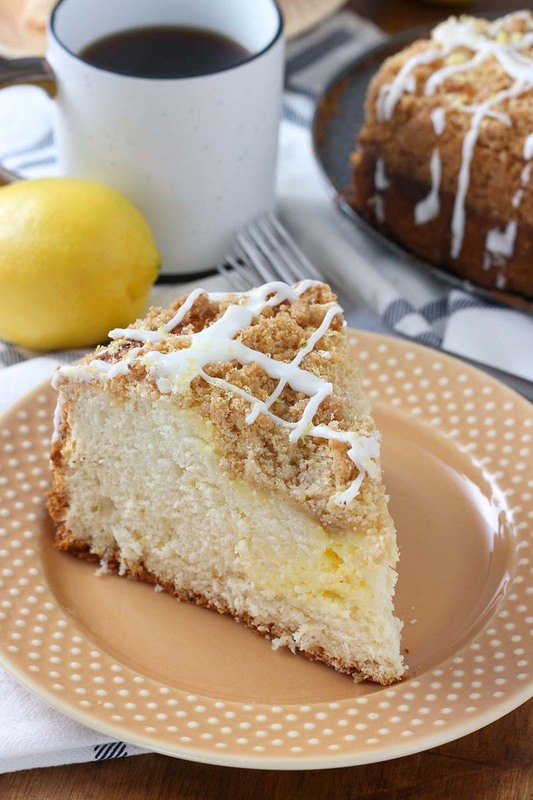 This easy coffee cake has a light, airy texture, a hearty crumb topping, and a sweet lemon cream cheese swirl! Spray and flour a 10 inch springform pan. Set aside. In the bowl of a stand mixer, combine 1½ cups flour, sugar, salt, lemon zest, and yeast. Add in milk, water, butter, lemon juice, egg, vanilla, and remaining 1 cup plus 2 tablespoons flour. Beat on low until just combined. Increase speed to medium and beat for 3 minutes. Scrape batter into prepared springform pan. Set aside. Beat together cream cheese and sugar for filling. Add in egg, lemon zest, and lemon juice. Beat until creamy. Pour over the top of cake batter. Swirl cream cheese mixture through batter with a knife. Cover with plastic wrap and allow to rise in a warm place until almost doubled in size, 45 minutes. Preheat oven to 375°F during the last 15 minutes of rise time. Prepare topping: Stir together flour, brown sugar, sugar, and salt. Stir in melted butter and combine until mixture resembles coarse crumbs. Gently sprinkle crumb topping over risen batter. Place in preheated oven. Bake for 20 minutes. Remove and cover top with aluminum foil. Bake for an additional 10 minutes, or until toothpick inserted in center comes out mostly clean. Do not over bake. Remove sides of springform pan. Drizzle with glaze and additional lemon zest as desired. Slice into 10 pieces and serve.